The constant international attention on the Middle East—Iraq, Iran, Lebanon, Syria, Jordan, Egypt, Saudi Arabia, and the Gulf States—is intriguing. However, the global obsession with Israel and its capital Jerusalem is mind-boggling. Media coverage focuses incessantly on what world leaders, politicians, celebrities, and other VIPs are saying about the Israeli-Palestinian conflict. Whatever their political or philosophical persuasion, they (and millions of ordinary people) eagerly voice their views on Israel … mostly negative. Some positive, such as those of us who recognize Israel’s extraordinary significance in God’s prophetic plan for humanity. For example: US Senators Lindsay Graham, Ted Cruz, Marco Rubio, and a few other Republicans frequently speak up on behalf of Israel. Although most Democrats in the United States Congress still support Israel over the Palestinian narrative, those percentages are declining; spear-headed by two new ultra-liberal members of the House of Representatives—Ilhan Omar (a Somalia Muslim elected in Minnesota) and Rashida Tlaib (of Palestinian descent, elected in Michigan). Both women regurgitate the same false accusations spewed by the Palestinian Authority, Muslim terrorist groups, Islamic leaders, and Muslims in general that Israel is occupying and oppressing the Palestinians, with help from the United States no less. As I have written in several prior Eye of Prophecy articles, there is absolutely no evidence (facts on the ground) whatsoever of Israeli apartheid against or oppression of the Palestinians. Israel is the only democratic nation in the entire Middle East, providing equal rights to its 1.8 million Arab citizens. And has granted self-governing privileges to some 4.7 million Palestinians (non-citizens by their choice) living in Gaza and Judea/Samaria (West Bank). You won’t find nearly this much liberty in surrounding Muslim nations extended even to their own people, let alone minority groups. Instead, there is persistent persecution of Jews, Christians, and even fellow Muslims who speak out against these Islamic regimes. There is a ton of facts to demonstrate Palestinian/Arab racial and religious hostility toward Israelis, not the least of which are relentless terrorist attacks. Such as two Israelis murdered this past week by a 27-year old Palestinian. One of whom was a 19-year old Israeli soldier; the other a 47-year old Rabbi. Thus, the prevailing global mindset that Israel is in the wrong—despite the clear history of Israel’s UN approved statehood and Muslim attempts to denigrate and/or destroy the one and only Jewish nation in the world—is dumbfounding. On the other hand, it is exactly what the Bible predicted long ago for the last days of the end times. To the contrary: the entire issue began with and was about “her” (Omar). Nonetheless, in a broader perspective, this unique Congressional resolution was all about Israel! Whether major Biblical prophecies such as the unprecedented rebirth of Israel as a sovereign nation and return of the Jews in great numbers to Israel coming to pass in our generation, or lesser known end-times developments like the status of Jerusalem’s Eastern Gate; the disposition of the whole world will continue to be affected by what’s happening in Israel. Picture circles made by throwing a pebble into a pond. The larger the stone, the more expansive the circles. Though Israel was (and still is, although growing steadily) a tiny country when it was reborn in one day’s time (May 14th, 1948), it landed in the sea of nations as a large rock, producing circles of contention like no nation in history. These controversial circles began with Arab countries that surround Israel, waging war against Israelis in 1948, 1956, 1967, and 1973. With current strategy shifted to BDS activities and terrorism …Palestinian rocket attacks, fire bombings, car-rammings, and knife/gun assaults on Israeli Jews. The circle widened to include non-Arab Muslim nations; equally, if not more, hostile toward Israel … such as Iran, Turkey, and Indonesia. A larger circle of Anti-Semitism has spread again in Europe and the Far-East, and even to the North & South American continents. Yet, the circles have also expanded enough to include governments of a few nations which have shown (at least token) favor toward Israel —diplomatically and economically. Although by and large, the populace of these nations (like Egypt and Jordan) remain anti-Jew and anti-Israel. Now picture in reverse, the circles contracting back to the original splash made by the rock of Israel. In concentric fashion, nations have focused attention on the circles as they get smaller and smaller. 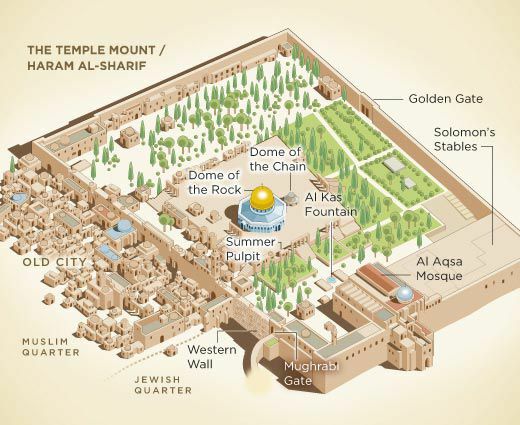 Beginning with the Middle East, narrowing to Israel, then Jerusalem, and finally the single most disputed place on the Planet … Temple Mount. And, now, as will be examined in this week’s article: one gate of Jerusalem. 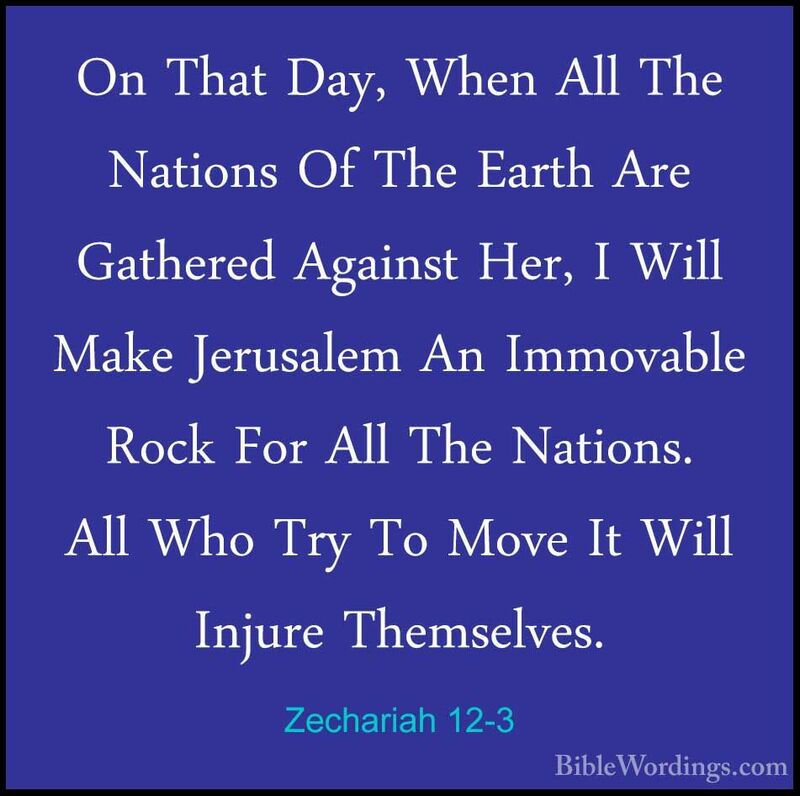 In fact, Scripture characterizes Jerusalem as a rock in the last days prophecy of nations and their armies uniting against Israel, hell-bent on reaching their perverted final solution to the Jewish problem. On that fast-approaching day, Jerusalem and Temple Mount will be defended ferociously by the Israelis. As the struggle for their very survival gradually goes against them, Messiah Jesus will suddenly step foot on the Mount of Olives and will fight alongside his people. The battle will spill over to the Valley of Jezreel and to Megiddo where the final war of the ages will be waged. With the Biblically predicted outcome of a resounding victory over all nations who would seek to annihilate God’s chosen people and dare to take on the Son of God himself. (See Eye of Prophecy article: Armageddon & Messiah’s Return … An Amazing Sequence of Events posted 2-3-18). “Go out through the gates! Prepare the highway for my people to return! Smooth out the road; pull out the boulders; raise a flag for all the nations to see. The Lord has sent this message to every land: ‘Tell the people of Israel, Look, your Savior is coming. See, he brings his reward with him as he comes.’ They will be called ‘The Holy People’ and ‘The People Redeemed by the Lord.’ And Jerusalem will be known as ‘The Desirable Place’ and ‘The City No Longer Forsaken’” (Isaiah 62:6-12, italics to emphasize that the smoothing out preparation, removing obstacles, and Jews returning to Jerusalem through its gates began with the Balfour Declaration of 1917, then the UN Resolution for Israel’s statehood in 1947. The Star of David flag flies over Jerusalem and alongside other flags at the United Nations). When the Persian King Artaxerxes approved Nehemiah’s journey to Israel to rebuild Jerusalem’s walls in 445 B.C., against all odds the walls and gates were rebuilt in an astonishingly short period of time. Nehemiah wrote: “So on October 2 the wall was finished—just fifty-two days after we had begun. When our enemies and the surrounding nations heard about it, they were frightened and humiliated. They realized the work had been done with the help of our God” (Nehemiah 6:15-16). Considering outside opposition from their enemies (some Jews worked while others stood guard with weapons) and the entire circumference of the rebuilt wall—about 4.6 miles, with some sections of the wall as high as 52 feet—including all the gates; this stunning project in seven weeks and three days was nothing short of a miracle. In Nehemiah’s time, there were 10 gates built into Jerusalem’s perimeter wall. Today there are eight gates, but only seven are open for access to the Old City of Jerusalem. Six of these accessible gates were built in ancient times, with the seventh built in 1538 by the Ottoman Sultan, Suleiman the Magnificent. 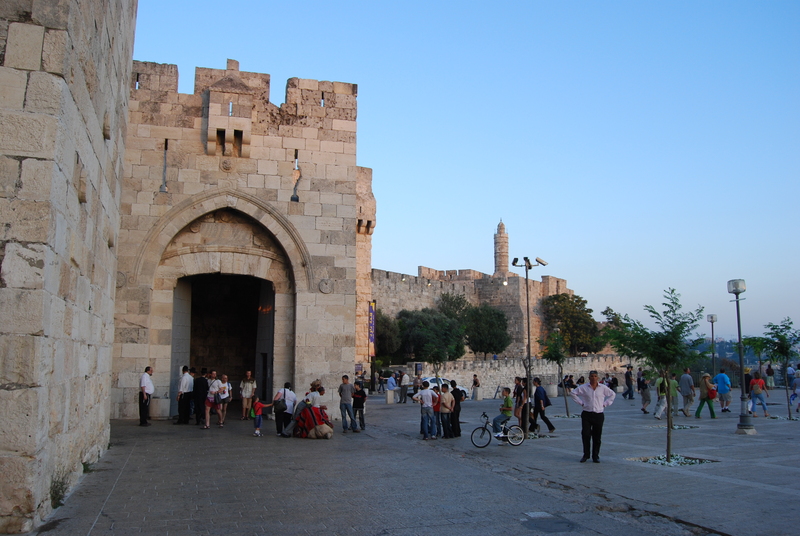 It is the Jaffa Gate, the most used entrance to the Holy City. The other six gates (restored during Suleiman’s reign) in use today are: The Zion Gate, Dung Gate, New Gate, Damascus Gate, Herod’s Gate, and Lion’s Gate. 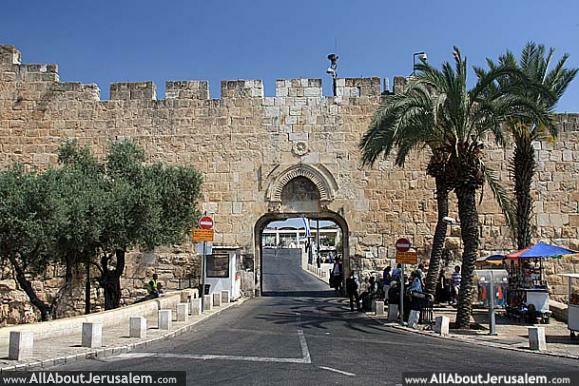 During our March 2006 trip to Israel, my sister and I went through two of these gates: Dung Gate & Jaffa Gate. What about the eighth gate, which was also restored in Nehemiah’s time? What is the mysterious significance of and current controversy over this gate? Regarding the recent incident between Israel and the Jordanians & Palestinians, was the gate reopened? Or does it remain tightly sealed? (It’s called the) Golden Gate because of the sometimes-golden glow and hue cast by the rising sun on the eastern wall and gate. Beautiful Gate in very ancient times because it was just that, both literally and figuratively considered the most sacred or holiest of the ancient gates of Jerusalem. Mercy Gate because Jews used to pray for mercy at this gate, in fervent anticipation of the coming of Messiah through the gate, which would lead to the restoration of the Shekinah Glory of God in the rebuilt Temple. For it was from the Eastern Gate that the glory of God left the Temple and through which God’s glory will return. This incredible gate is not only closed, it’s sealed … imbedded into thick stone walls on either side. In my estimation this unused, inactive, seemingly irrelevant gate was the most significant gate ever built; the most prestigious ever to be closed; and, one day soon, will be the greatest gate to ever be reopened. It is the oldest of the current existing gates in Jerusalem’s Old City Walls, having been built around 520 A.D. by Justinian I or perhaps (no later than) the 7th Century by Byzantine artisans. However, the current Eastern gate was built on ground level (obviously) over the remains of the much older gate, dating to the times of the second Temple (Herod’s Temple) which, of course, was built into the original (walls surrounding) Solomon’s Temple. We’ll look at that in more detail. But first, a recap of current events surrounding this enigmatic gate of Jerusalem, one that leads directly to Temple Mount. 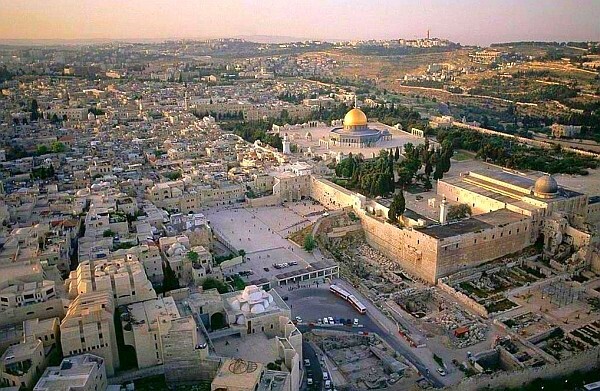 As the holiest site in Judaism, Temple Mount is the soul of Jerusalem and Jerusalem the heart of Israel. Although the Israelis reclaimed all of Jerusalem in the stunning Six-Day War of 1967, Israel subsequently relinquished administration of Temple Mount back to Jordan; even though Jordan had illegally usurped control of Jerusalem near the end of Israel’s War of Independence in 1948. Although Israel won that war, the Israelis elected not to contest Jordan’s illegitimate seizure of (most of) Jerusalem and Temple Mount for two reasons: (1) International pressure to keep Jerusalem “neutral”; (2) Israel’s desire not to prolong her War of Independence, satisfied (at that time) with survival of the reborn Jewish State via their overall victory against five Arab nations, including Jordan. For Muslims, Temple Mount (Arabs call it the Noble Sanctuary) is only their 3rd holiest site after Mecca and Medina; yet, according to Arabs, Islamic designation as 3rd in rank takes precedence over Israel’s 1st (most) sacred site. To the extreme that Jordan and Palestinians in Israel engage in blatant discrimination by refusing to allow Jews to ascend Temple Mount except at scheduled times; and forbid Jews to pray on Temple Mount or even exhibit any signs whatsoever of worship. The main reason that Israelis agrees to this “status quo” is to (theoretically) prevent an all-out Muslim intifada within Israel and/or an Islamic coalition attacking Israel from without. Nearly all Palestinian rhetoric that incites lone-wolf terrorist attacks against Israelis relate directly or indirectly to Temple Mount. The Palestinian/Arab intifada initiated in September 2000 (lasting until 2005 … hundreds of Israelis were murdered) under then Palestinian Authority President Yasser Arafat began soon after then Israeli Prime Minister Ariel Sharon ascended Temple Mount. This was just a few years after the Oslo Accords, in which the Palestinians solemnly agreed to stop all terrorist activity in Israel. They not only didn’t stop the terrorism, they increased it. Just three years ago or so, current PA President Mahmoud Abbas vowed not to allow the filthy feet of the Jews to desecrate Al-Aqsa Mosque (on Temple Mount). Abbas and his corrupt regime that oppresses its own people constantly accuse Israelis of “changing the status quo” on Temple Mount or desecrating it (by simply being there). When, in fact, it’s the Palestinians who are changing the rules. Concerning the Al Aqsa Mosque, please refer to Eye of Prophecy article: The Myth of Al Aqsa Mosque (4-16-16). Which conclusively confirms that this mosque was not the mosque visited by Mohammed in what was a mythical journey to Jerusalem to begin with. President Trump’s Deal of the Century, drafted primarily by his advisors Jason Greenblatt and Jared Kushner, has been in the news for over a year. However, the U.S. Executive Staff has decided not to publicize this Middle East peace proposal until after Israel’s elections scheduled for April 9, 2019. There has been rampant speculation over details of the plan, mostly from Muslim nations and especially from the Palestinian Authority. Without even knowing its contents, PA President Abbas has rejected the deal out of hand. In fact, Abbas has cut off all diplomatic relations with the United States; asserting that America will not be allowed to broker any agreement because he alleges that the deal will heavily favor Israel. This despite President Trump himself saying that both Israelis and Palestinians will need to make some hard concessions. One of these (many) rumors has intensified the already deteriorating relations between Israel and Jordan—which is only one of two countries (Egypt is the other) that has formally recognized Israel as a sovereign state. King Abdullah of Jordan is worried that one of Trump’s proposals (if it is part of the deal) will substantially reduce or even eliminate the Jordanian Waqf’s administrative control of all holy sites in Israel, particularly Temple Mount. Consequently, the Waqf Islamic Council conducted a conference on February 14th on Temple Mount itself. During this meeting, representatives of the Jordanian Ministry of Endowment participated in a guided tour of the Mercy Gate compound. *Note: Because most of the recent media coverage, including articles from the Associated Press, has referred to the Eastern Gate by one of its other names (Gate of Mercy or Mercy Gate), I’ll refer to it by that designation in this section of today’s article. In that February meeting the Waqf Council, with King Abdullah’s implied consent, added several Palestinian Authority officials to the council’s membership. This was a slap in the face against Israel as Israelis know that increased Palestinian administration of Temple Mount would lead directly to more aggressive action to do whatever they wanted to and on Temple Mount. Which, in turn, would undermine the status quo, i.e. stated and implied agreements regarding its daily management. Which is exactly what transpired and in a hostile way. Not long after this conference, Palestinians tore down fence barriers guarding the Mercy Gate, motivated by the Waqf’s decree that this compound would be reopened to Palestinians—in deliberate defiance of Israel’s ultimate sovereignty over Temple Mount. On February 20th, the Palestinians began to hold prayer sessions in this gate area. Israel had closed this gate to the Palestinians in 2003 for two reasons: (1) Several of those who “managed” the Mercy Gate compound were found to have direct ties with the terrorist group Hamas; (2) Illegal excavation by the Waqf itself that resulted in destruction or disposal of valuable Jewish artifacts; thereby, degrading this priceless archaeology site. For the express purpose of eliminating all physical evidence of the existence of both Temples that gave rise to the very name of this Jewish holy site … Temple Mount. Although this initial confrontation between Israelis and Palestinians resulted in closure of the entire Temple Mount area, it was soon reopened to Arabs. But that reopening only encouraged more Palestinian clashes with police, culminating in a firebombing of a small police station on Temple Mount itself on March 12th, 2019. 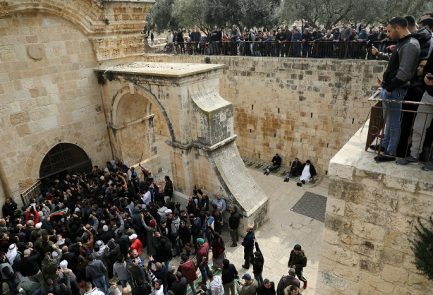 Following that incident, Israelis prohibited any gathering at the Mercy Gate compound but subsequently permitted Palestinian egress through other gate(s) access to Temple Mount via the Muslim and Christian quarters of the Old City of Jerusalem. 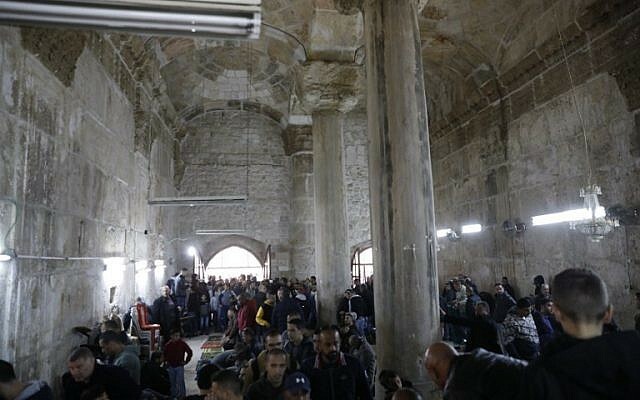 After sporadic clashes over several days between Palestinians and Israeli police, Israel issued a court order on March 17, 2019 to completely reclose the Mercy Gate. Israel has given Jordan 60 days to reply to this directive, with the implied response that of honoring the court’s legal decision and returning to the status quo in place before the whole Mercy Gate episode began. 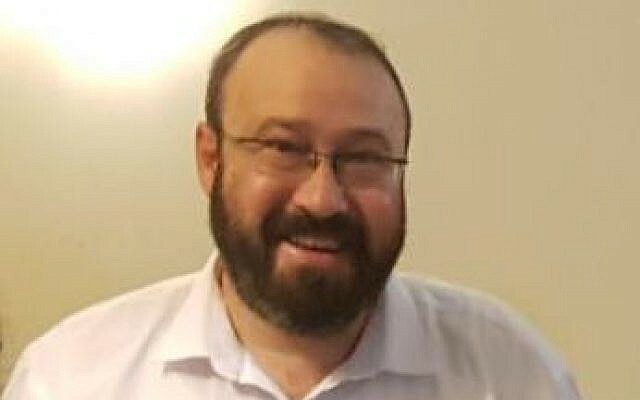 One Jordanian reaction was for some of its government officials to call for expulsion of Israel’s ambassador to Jordan—which hasn’t yet been done. Abdul Abu Basal, Jordan’s Minister of Islamic Affairs and Holy Sites, characterized Israel’s prevention of Palestinian activities in or near the Mercy Gate compound as, “an attack on all Muslims that touches the entire Islamic nation” (He meant the entire Islamic world). This is common Muslim/Palestinian twisted logic and tainted tactic; to blame Israel for the very things that Arabs do or say that sparks any given incident initiated by the Palestinians—in this case condoned and even assisted by Jordan. Israel has the final word in the matter. So says Israel and so says the true and living God of Israel. “…This is what the Lord of Heaven’s Armies says: ‘The towns of Israel will again overflow with prosperity, and the Lord will again comfort Zion and choose Jerusalem as his own’” (Zechariah 1:17). The day is soon coming when another of the Lord’s promises will come to pass: “Wake up, wake up, O Zion! Clothe yourself with strength. Put on your beautiful clothes, O holy city of Jerusalem, for unclean and godless people will enter your gates no longer” (Isaiah 52:1). What do journalists mean when they say that the Mercy Gate (some qualify by saying Mercy Gate “compound”) had been forcibly opened and infiltrated by Palestinians in defiance of Israel’s closing the gate in 2003? Does that mean that the Eastern Gate had been opened, then closed, then reopened in the 21st Century? “Then the man brought me back to the east gateway in the outer wall of the Temple area, but it was closed. And the Lord said to me, ‘This gate must remain closed; it will never again be opened. No one will ever open it and pass through, for the Lord, the God of Israel, has entered here. Therefore, it must always remain shut’” (Ezekiel 44:1-2, italics as a prelude to answering the question of the Eastern Gate currently sealed or open). In a moment we’ll examine the full chronological context of the Eastern Gate’s closure; when it was last sealed, if/when it will be reopened and by whom. For now, let’s clarify what reporters and Op-ed writers meant when they referenced The Mercy Gate. In reading the media accounts as this conflict unfolded over several weeks, I subsequently realized that the Eastern Gate (Mercy Gate) itself was not the compound referred to by the media. During my trip to Israel in March 2006, the Gate was completely intact and sealed tight as it had been for centuries. Below is one of many photographs clearly depicting the Eastern Gate. Because most on-line photographs of the eastern wall (gate) are not dated, it’s somewhat difficult to determine when they were taken. But no matter how recent the photos are or are not, the fact remains that the exterior Eastern Gate itself is still tightly sealed! Thus, the puzzle of whether this Gate had been opened or not is solved by awareness that the Mercy Gate complex identified by the media is exclusively situated on the interior of the Eastern wall. In contrast to the intact, unopened Eastern Gate of the OUTER WALL! 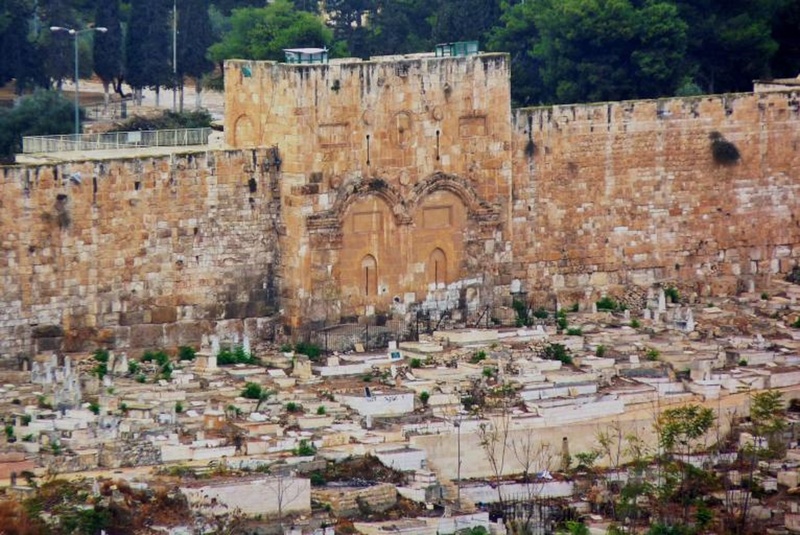 (Just as Ezekiel 44:1-2 says … east gateway in the outer wall of the Temple area)! Access to the inner wall area is only possible by entering through one of the other exterior gates to the Old City, then walking to the interior metal gate entrances that lead to the chamber of the Mercy Gate compound. I didn’t realize that there is an interior chamber on the other side of the exterior Eastern Gate, let alone as large as it is. In that regard, I was thinking in terms of most tourists and even many Israelis (who also didn’t know about the inner chambers). Which is: Recognition and identification of the Mercy Gate (Eastern Gate) as the exterior sealed gate that faces the Kidron Valley directly across from the Mount of Olives. Which is, in fact, the actual East Gate as identified in Scripture. The far end of these ancient interior rooms face the Dome of the Rock, which currently occupies the space where Solomon’s Temple, then the 2nd Temple stood. 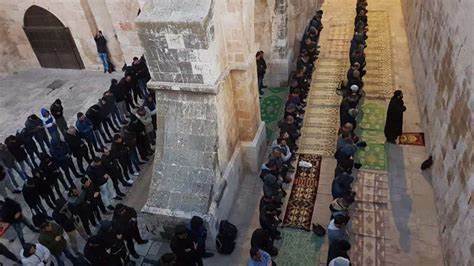 It is in and immediately outside these chambers where Muslims want to establish another prayer site on Temple Mount. Not that they need another … they already have the Dome of the Rock and Al Aqsa Mosque. Rather, their agenda is to further discredit the historical reality of the two Jewish Temples on Mount Moriah … Temple Mount. And to prevent any further Judaizing of Jerusalem and Temple Mount. When in fact: all Israel is as Jewish as anything can be! To deny this is to refute both Biblical and secular history. If someone is going to do that, they might as well rewrite any history that doesn’t suit their narrative. Which is exactly what many Muslims and Palestinians are doing. To further appreciate the historical accuracy of the Lord’s disclosure to Ezekiel (Eastern Gate must remain shut), we must place that prophecy in its precise prophetic context. The background begins in Ezekiel Chapter 40 and continues through Chapter 48 (the last chapter) of Ezekiel—the astonishing prediction of the rebuilt Third Temple. Both Daniel (Chapter 9) and Jesus in his Mount Olivet discourse (Mathew Chapters 24-25) subsequently allude to the rebuilt Temple and its desecration that takes place during the Tribulation. From our historical hindsight vantage point, we know that Ezekiel is not referring to the 2nd Temple (called Herod’s Temple), because God’s Shekinah glory never returned to that Temple after it was rebuilt by Zerubbabel and renovated by King Herod some 500 years later. Plus, the Lord had already foretold the destruction of Solomon’s Temple, and, in fact, had already departed from the Temple as witnessed (in real-time) by Ezekiel earlier in his ministry. “Then the glory of the Lord moved out from the door of the Temple and hovered above the cherubim. And as I watched, the cherubim flew with their wheels to the east gate of the Lord’s Temple…. Then the glory of the Lord went up from the city and stopped above the mountain to the east (Mount of Olives)” (Ezekiel 10:18-19 & 11:23, parenthesis mine). “After this, the man brought me back around to the east gateway. Suddenly, the glory of the God of Israel appeared from the east… And the glory of the Lord came into the Temple through the east gateway. Then the Spirit took me up and brought me into the inner courtyard, and the glory of the Lord filled the Temple” (Ezekiel 43:1-5, italics for emphasis). Then in the first two verses of Ezekiel Chapter 44 (which we read a few paragraphs ago), the Lord’s instructions for the East Gate of the outer wall to be kept shut … meaning until the Messiah would come. As other prophets tell us: Messiah’s appearance would (first) be to bring a new and final way of spiritual redemption to Israel, accomplished when Messiah Jesus initiated the New Covenant with his sacrificial death on the Cross and sealed that Covenant when he arose from the dead. Followed by Messiah’s return to establish the Kingdom of God on earth as contained in dozens of Old Testament prophecies. *Note: “The man” who disclosed all these things concerning the 3rd Temple was none other than Messiah Jesus in one of his Pre-Incarnate appearances during Old Testament times. See Eye of Prophecy article: Messiah’s Amazing Appearances Before He Was Born (posted 10-6-18). The fact that it was Messiah himself who revealed the 3rd Temple and the Lord’s (permanent) return to that Temple is no coincidence. It will be Messiah Jesus (Son of God and God the Son, express image of the Father … Colossians 1:15) who will enter Temple Mount directly through the Eastern Gate, that he himself will open. Just as Ezekiel said the glory of God would appear (to the 3rd rebuilt Temple) from the east; so did Jesus in foretelling his return say as a validation of Ezekiel’s prophecy, “For as the lightning flashes in the east and shines to the west, so it will be when the Son of Man comes” (Matthew 24:27). Therefore, the shutting and sealing of the Eastern Gate relates expressly to the return of Messiah to establish the Kingdom of God on earth. Which is why the Eastern Gate was open (having been restored along with all the walls and gates of Jerusalem by Nehemiah) during Jesus’s first arrival to earth … born of a Virgin, fully God and fully man. As the Son of God, Jesus knew full well that he would be rejected and crucified, but only after he entered Jerusalem hailed as the Messiah. 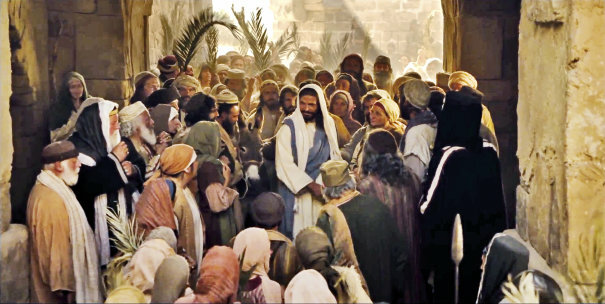 Because Jesus was/is God (John 1:1), God’s glory entered Jerusalem on Palm Sunday. Jesus rode on a donkey as prophesied by Zechariah (Chapter 9) into the Temple complex directly through the Eastern Gate. He began this ride on the Mount of Olives. “As he rode along, the crowds spread out their garments on the road ahead of him. When he reached the place where the road started down the Mount of Olives, all of his followers began to shout and sing as they walked along, praising God for all the wonderful miracles they had seen. ‘Blessings on the King who comes in the name of the Lord! Peace in heaven, and glory in highest heaven!’” (Luke 19:36-38, italics to emphasize that this road led directly to the Eastern Gate and heaven’s glory entered through that gate). However, because Messiah’s glorious entrance into Jerusalem was temporary, the gate must be (would later be) shut and sealed until God’s glory would return permanently to the Temple, i.e. Jesus’s Second Coming and Messianic reign from Jerusalem. Not until the New Jerusalem comes down from heaven at the end of the Millennium, will God the Father also dwell forever among his people—all those who have been redeemed by believing and receiving Messiah Jesus as personal Savior (See Revelation 21:1-7). As we know, the Roman Empire destroyed Jerusalem and the 2nd Temple in A.D. 70. It wasn’t until the 16th century that the outer walls and most gates of Jerusalem were fully restored by (as indicated earlier) Suleiman, the Ottoman Turk Sultan. Which is in keeping with God’s providential plan to sometimes use Gentile rulers to accomplish his sovereign will, i.e. Persian King Cyrus’s edict to rebuild the Temple and later Artaxerxes to restore the walls and gates of Jerusalem. Yet, Suleiman did something completely unexpected. It’s highly unlikely that he knew anything about God’s prophetic purpose that the Eastern gate be kept shut; however, Suleiman was aware that a Jewish Messiah was supposed to arrive in Jerusalem someday through that Eastern Gate. And according to Jewish tradition, his appearance would be preceded by Elijah the Prophet. Consequently, Suleiman ordered that the Eastern Gate be totally sealed, and a cemetery for Muslim graves be built in front of the outer gate. This would (presumably) prevent Elijah and the Jewish Messiah from fulfilling the prophecy of returning to Jerusalem via the Eastern Gate of Temple Mount, as no Jew would ever defile themselves by walking through a Gentile cemetery, especially one with Muslim graves! Thus, in sealing the Eastern Gate to prevent Messiah’s prophetic return, this Gentile ruler unwittingly fulfilled Biblical prophecy! Such is the sovereignty of our great and glorious God. What he says will happen, always happens. I repeat for emphasis: ALWAYS. What he declares will not happen (opening of the Eastern Gate until Messiah does so himself) will not happen. There is no one like the God of Abraham, Isaac, and Jacob. None but He can declare the end from the beginning. And then make it happen! Do you think Jesus Christ will be defiled by a few graves or deterred by the sealed gate itself? Hardly. Nothing defiled Jesus because he was undefiled … without sin. Jesus not only touched the untouchable (unclean) lepers and healed them, he also raised Lazarus from the dead by merely speaking to him. He will open the Eastern gate with a touch of his hand or a word from his mouth. I wasn’t worried that the Beautiful, Mercy, Golden, Eastern Gate had been opened; therefore, questioning the Lord’s prophetic plan. But, at first, it did get my attention. What’s going on here? There had to be an explanation. Now I/We know the full story behind yet another incident that fits perfectly with Biblical prophecies of the end times. We’re living in those very last days. “Open up ancient gates! Open up, ancient doors, and let the King of glory enter” (Psalm 24:7). There are also (spiritual) roads and gates that we must choose … through which one to pass. “You can enter God’s Kingdom only through the narrow gate. The highway to hell is broad, and its gate is wide for the many who choose that way. But the gateway to life is very narrow and the road is difficult, and only a few ever find it” (Matthew 7:13-14, words of Jesus). Said the prophet Isaiah who foretold of the coming Messiah’s (first) mission: “All of us like sheep have gone astray, each of us has turned to his own way; but the Lord has caused the iniquity of us all to fall on Him” (Isaiah 53:6, NASB). Messiah Jesus declared: “…I tell you the truth. I am the gate for the sheep. All who came before me were thieves and robbers. But the true sheep did not listen to them. Yes, I am the gate. Those who come in through me will be saved…” (John 10:7-9). Come quickly, Lord Jesus. Open the Eastern Gate and from Jerusalem establish your Kingdom of Righteousness, Justice, and Shalom on the Earth. Hallelujah to the Lamb of God! 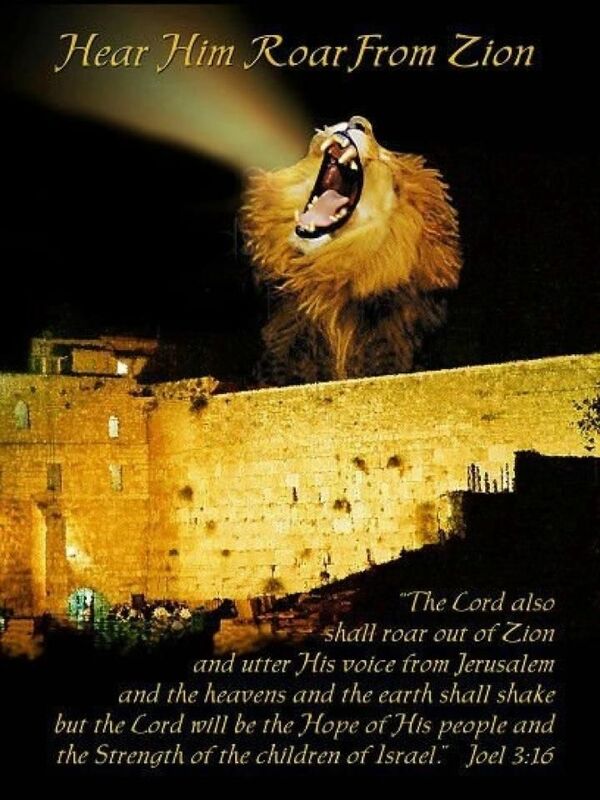 Praise to the Lion from the Tribe of Judah!